Two recent posts about empanadas, here and on Cachando Chile, have produced a flurry of requests for a recipe for those who cannot just pop over to the neighborhood empanada shop. Chilean caterer and cooking teacher extraordinaire, Sonia Rodríguez de Hoftstadt kindly offered to share her foolproof, no-fail recipe for Empanadas de Horno–de pino (beef)–of course! Sonia is truly a woman of the world, the daughter and wife of diplomats, she has spent much of her life abroad, lived in 9 different countries, and speaks 5 languages. She was trained as a simultaneous interpreter and finally turned to her true passion: food from around the world. 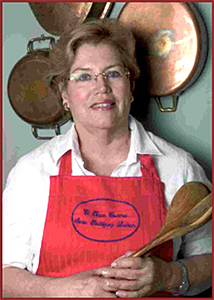 She teaches and caters through her company “El Toque Gourmet,” and is currently working on a book of the same title. Her specialties include (but certainly not limited to!) Asian Cooking, Mediterranean and European Food, American Desserts, and Chilean Asados. Truth be told, it’s always empanada time in Chile, but September—the month of Chilenidad—would not be complete without endless rounds of empanadas. These savory stuffed turnover (my brother calls them Hot Pockets) originally crossed the Atlantic with the Spanish some 500 years ago and are now found throughout Latin America. Each culture has its own versions, and I’m sure people from other countries get just as serious about their versions as Chileans do about theirs. 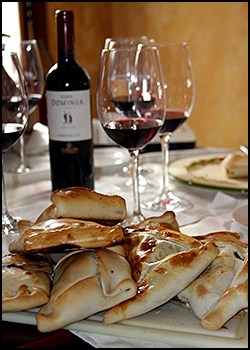 While Chilean empanadas come in all sorts of baked and fried shapes, sizes, and fillings, in September, the only empanada that counts is the most traditional of all: the empanada de pino del horno: a baked beef-stuffed meat turn-over, considered best when they emerge hot from a rounded adobe oven that dot the countryside in Central Chile.